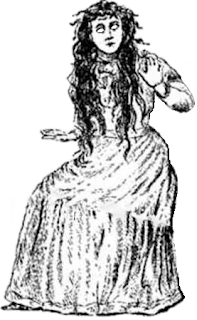 Appearing as a girl or young woman, pale and eyeless, stumbling through dark passages, a blind Agnes is an ill omen for those that see her. Anyone close enough to see the white holes of her eyes will have their own eyes stolen by Agnes. She will gain her victims eyes and with them sight. Once she is able to see, blind Agnes will attempt to flee. The poor soul that loses their eyes to blind Agnes will still see, but through the eyes set in Agnes face. Their vision will follow wherever Agnes goes while they must negotiate their actual surroundings sightless. Stories tell of men crying out about wondrous treasures only to step unknowingly off of ledges to their death. There are at least two ways for the victim of a blind Agnes to regain their sight. The first is by waiting, after a matter of hours they will regain their eyes and see as normal. The second is by slaying the blind Agnes. But as she falls dead, her eyes see things no man was meant to see, and a victim that regains their sight in this way is often reduced to whimpering and moaning of the horrible sights they were forced to witness. On the Goblinoid Game forum there is a section called Open Workshop in which Dan Proctor is taking ideas for various creepy crawlies. Have you considered making any of these for Labyrinth Lord? I read through all of your posts and find them very well written and I haven't seen one that I find is off. Some of my arrows miss the mark, but you are dead on. Hey thanks! I haven't been over there yet, been focussing on the S&W forums, but I'll start checking it out. I certainly want to share my creatures throughout the community. I notice you use a cc license on your blog, do you post your creations in any forums too? If I've posted at the S&W forum, does that mean I shouldn't cross post at Goblinoid? I actually do not post the exact same version on forums and on the blog, maybe a little extra work, but it creates a separate line. For example, my Serpent People in Knockspell #2 are different from my Serpent People player race. Everything I have posted on the Goblinoid Games forum I just made up for that forum. The S&W forum has a clause that anything you post can be used elsewhere, which the Goblinoid Games forum explicitly does not, quite the opposite, anything that sees print on the GG forum you will be compensated for. Which, as my blog is free (until it sees print, I suppose) so I don't expect anything from forum posts. I guess to actually answer your question, you can crosspost as the actual format is different between the two just slightly, Labyrinth Lord has a bit more detail. You can pick up the Labyrinth Lord rules for free in pdf or text form from the main website. Sounds like you could use this if you caught one. Since your eyes return after a few hours have the character shout out "Left! Right! Left Diagonal! Spiral Stairs! Orcs!" while another is writing it down, and create a map without having to scout it on their own.